In only six years, the Papatango New Writing Prize has built up a strong record. Previous winners include Dominic Mitchell, who has since won a BAFTA, Dawn King and Fiona Doyle. Tom Morton-Smith, author of Oppenheimer, was a runner-up in 2012. 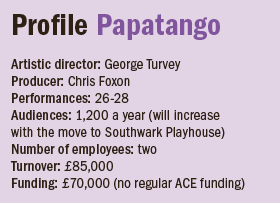 It’s a list to rival the Bruntwood or Verity Bargate awards – impressive given that the Papatango prize is run by an independent company, without the backing of a subsidised theatre. That record is, I suspect, down to a willingness to champion scripts that break away from the usual genres, styles and topics associated with new writing. The prize rewards adventurous writers and focuses on quality over import. Foxfinder, King’s winning entry, was a rural dystopia that served as a parable about otherness. Doyle’s Coolatully was a lyrical look at a lost generation in Ireland. This year’s winner Tomcat is all-out sci-fi, mulling over medical ethics and genetic screening. Papatango was founded in 2007 by three actors: George Turvey, Matt Roberts and Sam Donovan – all mates from their drama school days. Today, Turvey is the sole artistic director. He’s exactly what you’d expect of someone who played Batman in Batman Live – tall, broad-shouldered, handsome and decent. Chris Foxon, who joined as producer three years ago, is like his smart-as- anything sidekick. Amazing, yes, but also a sign of the number of emerging writers seeking a break. Arguably, there’s something exploitative about the model: a mass harvest for material. 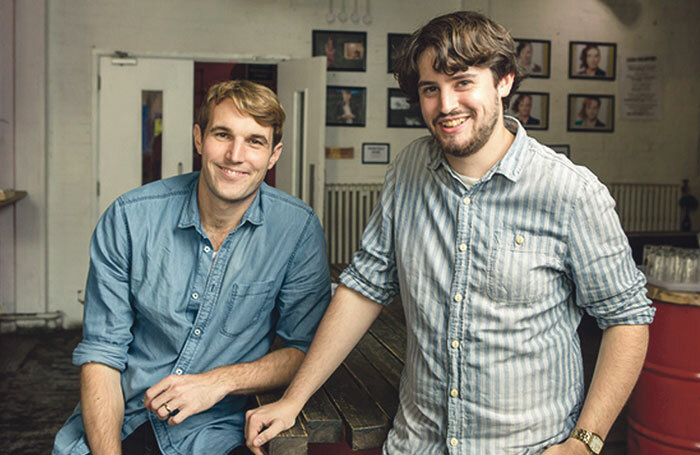 Turvey denies seeking showcase material – “we just wanted to create new work” – but he and Donovan starred in the winning play, Dominic Mitchell’s Potentials, with Roberts directing. “We were looking for the play we thought most exciting, something with a very new voice that we could get to production standard.” That meant cherry-picking a play and letting the rest fall by the wayside. It’s since become a far more responsible, rigorous operation – and a far bigger one. There were 300 entries the next year. Following Foxfinder’s success, it now receives 600 (Bruntwood gets almost 2,000). Rather than an ad-hoc panel of four readers, there are now nine carefully chosen individuals. About half the scripts are read a second time – “everything with a glimmer of potential gets a second opinion,” says Foxon – before a shortlist of six emerges. That’s when they drop the anonymity. “If someone’s got to that point, they deserve a face-to-face meeting.” The aim is as much about offering feedback and advice as about finding a writer they can work with. Personality plays a part. This is, after all, a prize recognising potential. “We’re offering a guaranteed production,” Foxon stresses. 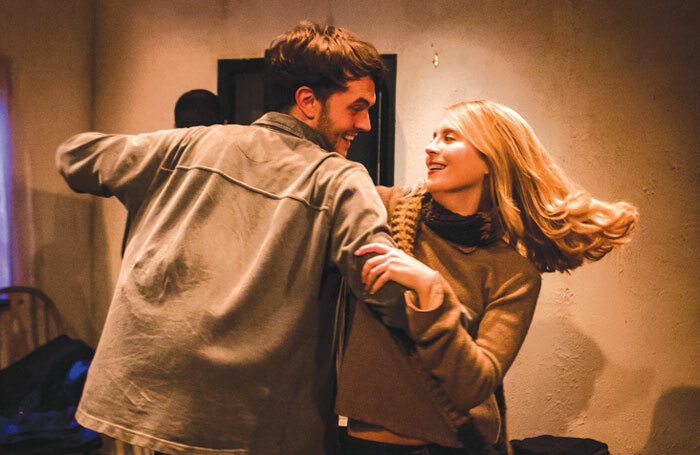 “If you put that on a writer who isn’t ready, it hinders more than it helps.” That’s even truer with the relocation to London’s Southwark Playhouse, a move to increase capacity and a mark of the prize’s burgeoning reputation. The plan is to further the commitment to, and care for, writers. Next year, thanks to newly secured funding, every entrant will receive feedback on their work. Foxon says they are also “looking to invest in writers that submit to the prize but don’t win”. Two have spent a year as resident playwright, a position funded first by the BBC and now as part of the Channel 4 Playwrights’ Scheme. 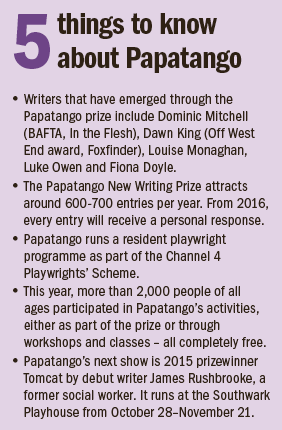 Next year, Papatango will produce its first production away from the prize. They hope, in time, to push beyond London as well, with half an eye on the Paines Plough model.